The last two years my long ant trail has not come back. I walk in the morning but I don't see them to step over. I don't know where they are walking now, but it's not where I walk. A month or so ago I felt the need for an ant fix and walked across the street to see if my old friends were still there. A few years back I stood, unknowingly, in a four inch wide exodus of ants. The were traveling between an expansion joint in the sidewalk and a nearby oak tree. I walked the big trail the other direction and found that this four inch wide phalanx of ants was moving between one oak and the next. Many, many, many ants in both directions. I was interested, but it was late at night (we were out hunting down owl sounds with B & G) and I didn't have time to play. This time it was late afternoon and there were only a few ants hanging out. One here, one there, but no super highway. I could, however, see the cleared path from the oak tree to the sidewalk. A casual scan would miss it, but look closely and you can see where all the little litter of the ground has been moved away from their path. A bit like lines on the Nazca plains. The path is there so clearly they are still active. I waited for the sun to begin to set and walked across the street again. This time I found an active group of ants just on the dirt side of the sidewalk where the trail to the oak begins - or ends. The ants were quite agitated, but they did not trail off toward the first oak (tree nest 1 in the photo below). Today I headed back to the ants. 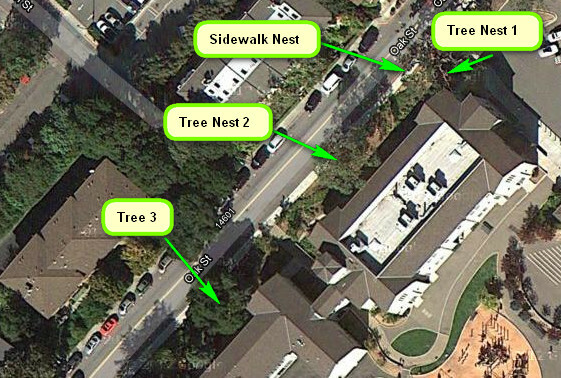 I wanted to see how the sidewalk nest and tree nest 1 get connected. It was a warm evening with no wind. It was 7pm and the sun was low enough to rake across the dirt. Ants at the dirt side of the sidewalk path were out and about, but wandering more than trailing. They covered a fan shape about six feet in length, with the main axis on the trail to tree nest 1 and the apex where the sidewalk expansion joint meets the dirt. On the tree side the ants were active, but staying on the tree. They moved up and down and all around, but didn't leave the tree. I waited. Over the next quarter hour the sidewalk side slowly grew the length of the fan out to about 8 feet, while narrowing the lateral width. Clearly they are moving towards the tree, but in a lazy way. On the tree side more ants are appearing lower down the tree, but still no one is leaving the tree. Another ten minutes and the sidewalk side is about the same. I see a thin, two wide trail leading toward the tree, but it dissipates after 6 feet. On the tree side there are finally a few ants on the ground. They stay mostly within a two foot circle tangent to the point where the trail meets the tree base. Some ants stray a bit further, but there is no big movement. The sun goes down another notch. I say hello to the few people strolling the street. I'm sure I suffer a few looks from the people who slowly drive by. We're now 30 minutes into the observation and I see a change. The sidewalk side is the same, but the oak tree nest mates are ramping up. A group of active ants has moved another three feet toward the sidewalk. The base of the tree is running with ants at the take off point. These ants are not covering the entire base of the tree, but are all over a one foot wide strip from the take off point back to disappear into the gnarly bark of the trunk. Watching an exposed trail on the tree I can sense pulses of ants. A surge comes moving down, then it eases. Then another surge. On the forward tip of the trail ants are now seriously moving toward the sidewalk. Not in a straight march, but I watch them take ground, scout around, then take more ground. Some ants move back toward the oak, but most of them keep foraging and forging ahead. The sidewalk group has moved out another foot, but the oak group is leading the charge. It took about 40 minutes for the two lines to meet. It happened about 2/3 of the way from the oak to the sidewalk. Despite all my close attention I didn't see the first meeting happen. One time I looked down on what had been a bare patch of the trail and saw ants roaming around. Cripes, I missed it! I watch for another 10 minutes as the tree nest ants continue to surge toward the sidewalk. The raking light makes it easy to assess the overall motion of the ants, and it is clearly from the tree to the sidewalk. I only have to stare at the randomly moving shadows to discern a general sense of the flow. It must be 50:1 from tree to sidewalk at this point. Eventually the tree ants reach the sidewalk end of the trail. I half expected some explosion of sidewalk ants to start streaming to the tree; that didn't happen. Ants began to swarm up onto the sidewalk, but it mostly seemed like the tree ants saying "hello" and milling around. Next time I should bring a chair, a flashlight, a camera, and a measuring tape! So many questions... and still no one will pay me to look at these things.